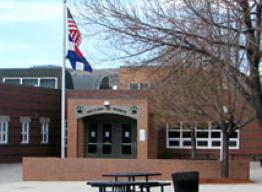 Webber Middle School, opened in 1990, is named for Don Webber, former PSD teacher, coach, principal, and superintendent. Throughout the school community, 6 Ps are emphasized: Prompt, Polite, Positive, Productive, Persistent, and Proud. Webber Middle School offers academically rigorous, standards-based curriculum for 6th, 7th and 8th grade students. We offer challenging academic class options, including Pre-Advanced Placement courses in core classes for 7th and 8th graders and a full exploratory wheel for 6th Grade students. These core academic areas are balanced with other choices in electives, arts and athletics to ensure a whole child approach to learning. Webber recently began a 1:1 laptop home/school program with all 6th and 7th grade students to enrich the learning cycle for our school community. Webber also offers a wide variety of enrichment activities for our students that include our award winning band, orchestra and choir programs. Students can also participate in drama, theater, outdoor living, Science Olympiads, Math Counts, The WAVE program and our student leadership program (Web Leaders). Webber students also participate in PSD middle school athletics , where our school community has won 50+ district championships over the last 25 years. We also support student field trips to the American Southwest, Costa Rica, Germany and other European countries on a yearly basis, that provides enriching outreach opportunities for our students.